It took science, faith, and a bit of magic (oh, and 10 years and a million bucks) to bring a lost version of a pioneering silent film classic back to colorful life. Here’s how it happened. So he did. 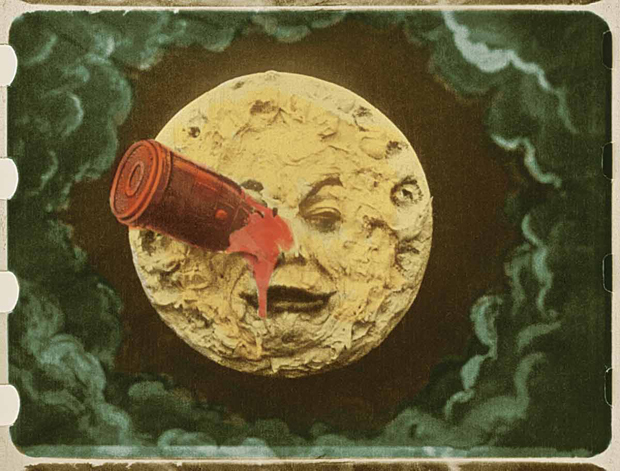 A decade later, Bromberg is putting the finishing touches on The Extraordinary Voyage, a documentary that chronicles both the making of Melies’ groundbreaking 1902 film and the meticulous, against-all-odds process of restoring it to its full-color glory. The documentary, which closes with the color A Trip to the Moon, complete with a new soundtrack by the electronica group Air, will have its world premiere November 11 at New York City’s Museum of Modern Art (the restored short itself debuted at the Cannes Film Festival earlier this year). The MoMA premiere culminates a 10-year process that took roughly a million dollars and a faith in technology to render a cinematic feat that even the most seasoned experts had deemed impossible. “It’s just sheer bravado to think you can pull that off,” says Tom Burton, director of restoration services at Technicolor, who came on board a year ago for the final stage of restoration. “This is cinematic altruism at its best,” says Burton, who works for Technicolor in Hollywood, where he has overseen such high-profile film restorations as The Little Mermaid, Breakfast at Tiffany’s, and Mr. Hulot’s Holiday. “They did it for the art and for film heritage, not for a high-profit Blu-ray release,” as is the case with most of his projects. When the digital files came to Burton, he was charged with piecing together a rather complex puzzle. “It was pretty overwhelming at the beginning. ‘How in the hell are we going to figure out the order?’” It was a mishmash of full frames, half frames, many of them multiples and in a variety of file formats. His team searched for what he calls the “hero” images, those with the best sharpness, the best color, and the most stable images, to anchor the resurrection. Bromberg justifies Air’s funky score as a fleeting gimmick meant to interest younger people in the restored film. “The film has its own life without the Air music,” he says. Melies did not earn much money off of his creation. “There were no royalties,” explains Bromberg. “Once the print was sold to an exhibitor, he could show it as long as the print would run in the projector.” Early films were mostly newsreels and travelogues, shown together at fairgrounds, not yet in proper cinemas. Hugo (and Selznick’s book on which it is based) is set in 1931 and depicts Melies as bitter and alone, an emotional state that Selznick imagined based on research about Melies, who by that time had fallen into obscurity as technology passed him by; silent films had given way to talkies and his talents were no longer valued.